Take a small skillet out and pour 1 tablespoon of the oil into it, placing the skillet over medium heat. Once the oil’s hot, toss in the onion, cooking it for 6 minutes or until it’s softened. Transfer the softened onions to a large mixing bowl, letting them cool before adding the following ingredients to the bowl as well: chicken, bread crumbs, salt, paprika, garlic powder, and pepper. Stir well to combine, putting a lid on the bowl afterwards and placing it in the fridge for one hour. Take the bowl out of the fridge and roll the chicken mixture into 32 balls (about 4 teaspoons of the mixture per meatball). Preheat your oven to 350 degrees. Take a rimmed baking sheet out and spray it with cooking spray (we lined our baking sheet with aluminum foil and then sprayed the foil with cooking spray). Take a large skillet out and pour 2 tablespoons of the oil into it, placing the skillet over medium-high heat. Once the oil’s hot, add a portion of the meatballs in, gently turning them now and then for 3 minutes or until they get browned all over (we had to turn them frequently so they wouldn’t get burnt). Transfer the browned meatballs to the baking sheet. Repeat with remaining meatballs, adding in the last tablespoon of oil if necessary. Place the baking sheet in the oven for 15 minutes or until the meatballs are fully cooked. 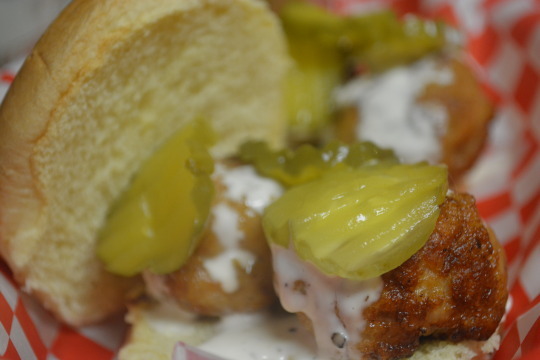 Serve the meatballs on the buns, topping the meatballs with the pickles and White Barbecue Sauce. Add all of the ingredients to a medium-sized mixing bowl, stirring until combined and smooth. You can serve this right away or cover and stick it in the fridge for up to a week. 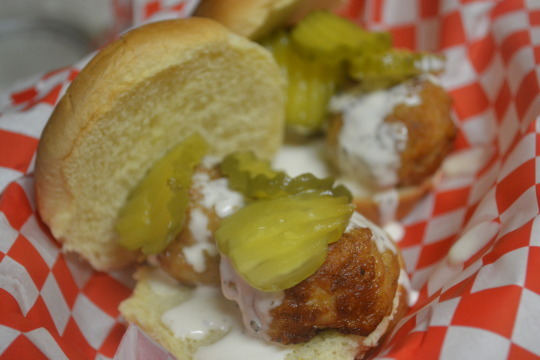 We love Alabama barbecue so when we saw a meatball slider version, we had to try it out ! You get a little bit of smokiness in the meatballs and while the meatballs taste good on their own, these sliders taste fantastic once the White Barbecue Sauce is added on. The sauce was creamy and tangy and paired wonderfully with the meatball. The pickle slices only add more flavor as well as some crunchiness to the dish that’d be missing otherwise. Hope you enjoy these as much as we did ! We got this recipe from Taste Of The South. We weren’t paid in any form to promote Pepperidge Farm or Taste Of The South.